Simple color-based detection of a U-shaped object for FIRST Robotics. This module isolates pixels within a given HSV range (hue, saturation, and value of color pixels), does some cleanups, and extracts object contours. It is looking for a rectangular U shape of a specific size (set by parameter objsize). See screenshots for an example of shape. It sends information about detected objects over serial. This code was loosely inspired by the JeVois ObjectTracker module. Also see FirstPython for a simplified version of this module, written in Python. This module is provided for inspiration. It has no pretension of actually solving the FIRST Robotics vision problem in a complete and reliable way. It is released in the hope that FRC teams will try it out and get inspired to develop something much better for their own robot. The basic idea of this module is the classic FIRST robotics vision pipeline: first, select a range of pixels in HSV color pixel space likely to include the object. Then, detect contours of all blobs in range. Then apply some tests on the shape of the detected blobs, their size, fill ratio (ratio of object area compared to its convex hull's area), etc. Finally, estimate the location and pose of the object in the world. Pipelines 2-3 use a narrow and broader learned HSV window over time. Detections from all 4 pipelines are considered for overlap and quality (raggedness of their outlines), and only the cleanest of several overlapping detections is preserved. From those cleanest detections, pipelines 2-3 learn and adapt the HSV range for future video frames. S: the object has 8 vertices after shape smoothing to eliminate small shape defects (a U shape is indeed expected to have 8 vertices). E: The shape discrepency between the original shape and the smoothed shape is acceptable per parameter ethresh, i.e., the original contour did not have a lot of defects. M: the shape is not too close to the borders of the image, per parameter margin, i.e., it is unlikely to be truncated as the object partially exits the camera's field of view. V: Vectors describing the shape as it related to its convex hull are non-zero, i.e., the centroid of the shape is not exactly coincident with the centroid of its convex hull, as we would expect for a U shape. U: the shape is roughly upright; upside-down U shapes are rejected as likely spurious. OK: this thread detected at least one shape that passed all the tests. The black and white picture at right shows the pixels in HSV range for the thread determined by parameter showthread (with value 0 by default). This module can send standardized serial messages as described in Standardized serial messages formatting. One message is issued on every video frame for each detected and good object. The id field in the messages simply is FIRST for all messages. NOTE: 3D pose estimation from low-resolution 176x144 images at 120fps can be quite noisy. Make sure you tune your HSV ranges very well if you want to operate at 120fps (see below). To operate more reliably at very low resolutions, one may want to improve this module by adding subpixel shape refinement and tracking across frames. The default parameter settings (which are set in script.cfg explained below) attempt to detect yellow-green objects. Present an object to the JeVois camera and see whether it is detected. When detected and good enough according to a number of quality control tests, the outline of the object is drawn. You need to provide the exact width and height of your physical shape to parameter objsize for this module to work. It will look for a shape of that physical size (though at any distance and orientation from the camera). Be sure you edit script.cfg and set the parameter objsize in there to the true measured physical size of your shape. You should adjust parameters hcue, scue, and vcue to isolate the range of Hue, Saturation, and Value (respectively) that correspond to the objects you want to detect. Note that there is a script.cfg file in this module's directory that provides a range tuned to a light yellow-green object, as shown in the demo screenshot. 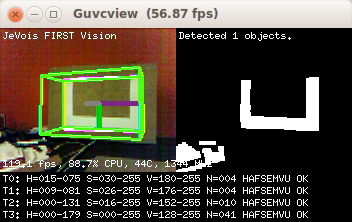 Tuning the parameters is best done interactively by connecting to your JeVois camera while it is looking at some object of the desired color. Once you have achieved a tuning, you may want to set the hcue, scue, and vcue parameters in your script.cfg file for this module on the microSD card (see below). Typically, you would start by narrowing down on the hue, then the value, and finally the saturation. Make sure you also move your camera around and show it typical background clutter so check for false positives (detections of things which you are not interested, which can happen if your ranges are too wide). JeVois allows you to store parameter settings and commands in a file named script.cfg stored in the directory of a module. The file script.cfg may contain any sequence of commands as you would type them interactively in the JeVois command-line interface. For the FirstVision module, a default script is provided that sets the camera to manual color, gain, and exposure mode (for more reliable color values), and other example parameter values. # Demo configuration script for FirstVision module. # THIS IS REQUIRED FOR THE 6D POSE ESTIMATION TO WORK.